PLEASE CHECK YOUR MOTHERBOARDS LIST OF APPROVED RAM BEFORE ORDERING. Model F3-10666CL9D-8GBSR Number of Pins 240 Bundle Listing Yes Capacity per Module 4 GB Number of Modules 1 Type DDR3 SDRAM MPN Does Not Apply Brand G. SKILL Bus Speed PC3-10666 (DDR3-1333) Form Factor DIMM Total Capacity 4 GB UPC Does not apply. (2x 8GB=16GB). Error Checking:Non ECC. Low Density: Yes. We will work with you and try to create a win win scenario for you and us. It may get to your Country sooner. ATOMIC OVERLOAD is dedicated to getting you exactly what you paid for as fast as we can. Doesn't get any simpler than that. Brand G. SKILL MPN Does Not Apply Number of Pins 240 Total Capacity 4GB Capacity per Module 2GB Bus Speed PC3-10666 (DDR3-1333) Type DDR3 SDRAM Form Factor DIMM Bundle Listing Yes UPC Does not apply. Speichertaktfrequenz 1333 MHz. Interner Speichertyp DDR3. Speicherlayout (Module x Größe) 4 x 4 GB. RAM-Speicher 16 GB. Speicherkanäle Quad. Speichertyp PC3-10600/10666. CAS Latenz 9. Model F3-1333C9D-16GISL Modified Item No Custom Bundle No Number of Pins 240 Capacity per Module 8 GB Number of Modules 1 Type DDR3 SDRAM Bundle Listing Yes MPN Does Not Apply Brand G. SKILL Bus Speed PC3-10666 (DDR3-1333) Form Factor DIMM Non-Domestic Product No Total Capacity 8 GB UPC Does not apply. (25x 2GB=50GB). Error Checking:Non ECC. Low Density: Yes. Manufacturer: Mixed. Platform Support: desktop/pc. Manufacturer Part Number: N/A. We will work with you and try to create a win win scenario for you and us. · All products being sold are used, unless otherwise stated. G.Skill PC3-10666 2 x 4 GB DIMM 1333 MHz DDR3 SDRAM Memory (F3-10666CL9S-4GBRL). Condition is Used. Shipped with USPS First Class Package. Model F3-10666CL9D-8GBRL Number of Pins 240 Bundle Listing Yes Capacity per Module 4 GB Number of Modules 1 Type DDR3 SDRAM MPN Does Not Apply Brand G. SKILL Bus Speed PC3-10666 (DDR3-1333) Form Factor DIMM Total Capacity 4 GB UPC Does not apply. They are new without the outer box. These DIMMs operate at a cool 1.5V for better internal temperature and compatibility. G.SKILL Ripjaws X Series 32GB 240-Pin DDR3 SDRAM DDR3 1333 F3-10666CL9Q-32GBXL. Speed - DDR3 1333 (PC3 10666). Type - 240-Pin DDR3 SDRAM. Capacity - 8GB (2 x 4GB). Model - F3-10666CL9D-8GBRL. Heat Spreader - Yes. Color - Red. Multi-channel Kit - Dual Channel Kit. G.Skill 16GB (2x8GB) DDR3 PC3-10600 Desktop RAM 1333MHz CL9-9-9-24 1.50V P/N: F3-10600CL9S-8GBNT. G.Skill 16GB (2x8GB) DDR3 PC3-10600 Desktop RAM 1333MHz CL9-9-9-24 1.50V P/N: F3-10600CL9S-8GBNT. This item is used, pulled from a working system, and tested. Skill PC3-10600 8GB. We are the Hi-Tech Lovers. Hope you will appreciate our seriousness and reliability. You can always count on us! For any information, we're here. Give us a chance! Part Number: G.Skill F3-10600CL9S-8GBNT. Skill PC3-10600 16GB. We are the Hi-Tech Lovers. Hope you will appreciate our seriousness and reliability. You can always count on us! For any information, we're here. Give us a chance! Part Number: G.Skill F3-10600CL9D-16GBNT. Ripjaws X Series. DDR3 1333 (PC3 10666). 4GB (2 x 2GB). 240-Pin DDR3 SDRAM. Dual Channel Kit. Multi-channel Kit. We will try to resolve any problem that might arise. Tested and fully functional. Good condition I do not need it anymore. Speichertaktfrequenz 1333 MHz. Interner Speichertyp DDR3. Speicherlayout (Module x Größe) 8 x 8 GB. Höhe 40 mm. CAS Latenz 9. Kühlung Kühlkörper. Speicherkanäle Quad. Unbuffered Speicher Ja. Both in excellent condition perfectly working. Desktop ram. 2 4GB memory sticks. Works great. Pulled from working computer. Shipped same day. Tested Speed 1333MHz. SPD Speed 1333MHz. Capacity 2GB (2GBx1). It’s the best choice to build a budget performance PC. Fan lncluded No. Error Checking Non-ECC. We are the Hi-Tech Lovers. Hope you will appreciate our seriousness and reliability. You can always count on us! For any information, we're here. Give us a chance! It's designed for PC enthusiasts, and is available to the masses. Used, normal wear , please view the pictures for details . The photos shows exactly what you'll be receiving and includes. If your have any problem with the item please contact us immediately, to resolve the problem. Thank you. 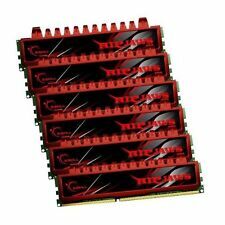 SDRAM DDR3 1333 PC3 10600 Desktop. G.SKILL 8GB 2 x 4GB 240-Pin F3-10600CL9D-. Item # GSKILL 2x4 DDR2. All passed the test! You are looking at aG. WHAT YOU SEE IN PICTURES IS WHAT YOU GET, unless otherwise stated. If this item is used - normal wear & tear is to be expected. We do our best to test and describe every item honestly. Used lightly in desktop pc, works great. 2GB each, total of 8GB. Great for low-end gaming, desktop use, and office use. All 4 for $40!! Part number for the kit is F3-10666CL9D-8GBRL. F3-10666CL9D-8GBRL is a 2 x 4GB kit, we verified in BIOS, Windows and on G.Skill website. The smaller version of the HTPC had to use low profile sticks and these high performance sticks with the red heasinks simply wouldn't fit.